Wow, kid’s TV just keeps getting better: Skaville sneak preview. Password is “hortense.” Thanks, Poliana! Join the Magnificent Seven for their Ironman competition this Sunday (June 5, 2011). The ride leaves at 10am from Dunkin Donuts on Northwest Highway (just west of Harlem) and ends at Kristof’s Entertainment Center in Round Lake Beach. The Ruckus crew will join the Mag7 for the ride, and the Ton Up Club will meet at Kristof’s. Kristofs has a bar and pizzaria on premise. Mag7 is organizing a package price for all three ironman events. Author illnoisePosted on 01.06.11 Categories Chicago, Rallies and Rides, Scooter Kids! 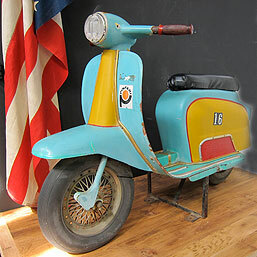 Philadephia-based online vintage-resale boutique Three Potato Four is currently offering a vintage carnival-ride scooter for $1250. Most of us rarely pay that much for a actual, running vintage scooter but, you have to admit this thing is a neat find. They’re calling it a “Vespa” and it has a few Vespa-like features, but scooter nerds will recognize most of the features as more Lambretta-esque. Thanks to Vina for the link. This morning I was alerted by Facebook to a collection of photos from a trip to France posted on Flickr by April from Scoot Magazine. One photo in particular of a child on a very realistic modern scooter coin operated ride struck me as a significant demonstration how France has very different take on scooters than America. I found it interesting that while most American kids I’ve come across love scooters, on average they grow up to join a society that loves Harleys and freely uses the term ‘Crotch Rocket’. Maybe if we had a few more coin operated scooters outside Walmart, as a nation, we too could appreciate sensible personal transportation choices or riot in the streets when they cut benefits or raise the retirement age. Author BrookePosted on 22.10.10 Categories 2sb News, Europe, Lifestyle, Scooter Kids! Via Jamie: Fred Perry has a new range of kids’ clothing. I’ll just leave it at that. Author illnoisePosted on 23.09.10 Categories Mods, Scooter Kids! Balloon Artist Jeremy Telford makes a balloon Vespa. Yes, you just spent two minutes and 36 seconds watching a balloon artist, and you liked it. Do you feel dirty? Here’s the backstory from Glen G. on Modern Buddy. Thanks for sharing, Glen! Update: here’s Jeremy’s site. Wow. (Finally!) 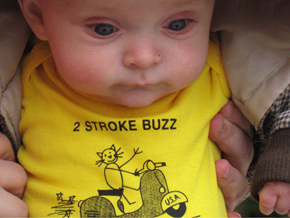 NEW 2strokebuzz T-shirts, a very limited-edition tribute to one of the greatest albums ever, and because our son Calvin (obviously) needed one, we did a few onesies. We only printed 36 shirts, so if you’re actually twee/old enough to get the reference, order fast! Author illnoisePosted on 25.04.10 25.04.10 Categories 2sb Mersh, 2sb News, Books & Magazines, Featured Stories, Scooter Kids!, Scootmoto, Stuff to Buy1 Comment on Scootmoto Update! Scoot Magazine points out that Mattel has run out of ideas for re-purposing the “Barbie Vespa” mold. In most middle-school shop classes, you’ll make golf-tee games or a footstool. In Tom Boissonnault’s “Technology” class at Eastchester Middle School, you’ll restore a Vespa. Best of all, it’s actually cheaper than Vietnamese child labor! Note: This story is three months old, I was sort of busy in late October. Thanks, Victor. Luckily, I never clean out my inbox. Author illnoisePosted on 14.10.09 Categories Oddities/Customs, Scooter Kids! Eric tweets that the new issue of Amazing Spider-Man (#602) features Mary Jane on a Lambretta. Is that computer-generated art or a gouache painting? And why is Mary Jane so huge? I avoid comic book stores because I’ve chosen to waste all my disposable income on scooters and records, but I might have to pick that up. Eric runs Modern Buddy, and even if you hate Twitter, follow his “Scooterism” on RSS, it’s always great stuff. 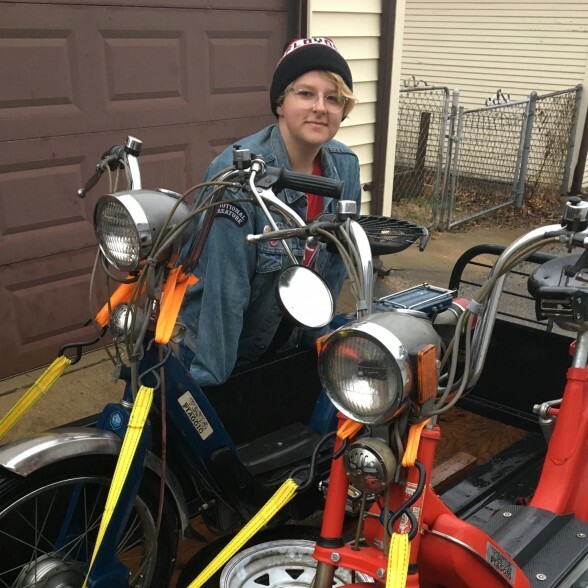 Speaking of comics, Eric (OTHER Eric) at Chicago Scooter Club recently posted a roundup of scooter comics, including Chynna Clugston-Major’s “Blue Monday” and “Scooter Girl” series and a new “Mods and Rockers” comic. And don’t forget Ed Brubaker’s Deadenders and The Originals by Dave Gibbons of Watchmen fame. Any time you feel your scooter obsession is way out of control, just be thankful you’re not into Blythe dolls. Or, like our friend Ana, way too into both.